This event is free to current UMFA members. Non-current members (new or lapsed membership) can also attend for free by renewing their membership or becoming a member first (via online membership application). Family members of student members can also attend for free, you can include family members in the same registration. Auditors can register this event for $20. Lunch is $10 and can be ordered at the same time. Payment can be either check or online (PayPal). 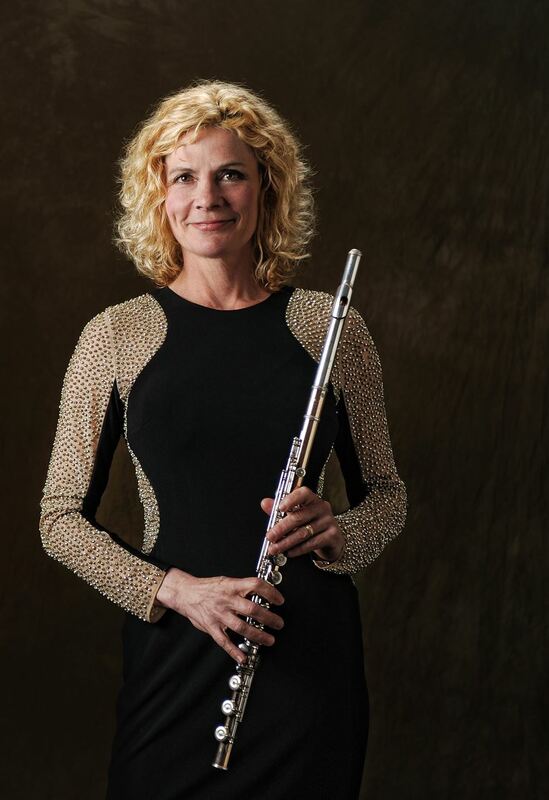 Rhonda Larson is a Grammy Award winning flutist who entered the national music scene by winning first prize in the National Flute Association Young Artist competition at the age of 22, including a Carnegie Hall debut. Flute Fest exhibits will be open until 4:00pm with flutes, flute music and other fun flute related items! We hope you find everything on your wish list at Burkart Flutes, The Flute Shop (Schmitt Music) and Groth Music. Listen to 3 of the finest college and young adult flutists from the Midwest, as they compete in the final round of competition! The Midwest Flute Ensembles Recital will feature jr. high and high school flute ensembles as well as college groups. In our continual effort to promote geographical outreach, we welcome groups who have traveled a distance to perform on this program. Join us for a lively and nontraditional Group Participation class. An engaging percussion background rhythm leads us in various physical flute activities, including call-and-response phrase inventing, liberating us from the written page. This fun class is appropriate for all learners of all ages. Be ready to move, be engaged and have a great time! Learn about flutes from around the globe! If you own any ethnic flutes, feel free to bring them to the class to increase your individual participation. This class is appropriate for anyone who is curious to learn more about non traditional flutes. You do not need to own ethnic flutes to attend, but if you have any, we encourage you to bring them! This will be a great opportunity to explore the wide world of flutes, without leaving "your own backyard". This masterclass is a wonderful opportunity devoted to our Jr. High and High School Flute students. Timothy Hagen is an internationally acclaimed flutist, praised for his "technical virtuosity and musical sensitivity" (NewMusicBox). ​Dr. Hagen is currently on the faculty of the Mead Witter School of Music at the University of Wisconsin-Madison, where he also serves as flutist in the Wingra Wind Quintet. He has previously taught at Oklahoma State University and The University of Texas at Austin, as well as in partnerships with the Los Angeles Philharmonic, Lincoln Center Education, and Dallas Symphony. His teachers include Marianne Gedigian, Jim Walker, Philip Dunigan, Renée Siebert, Tadeu Coelho, Chelsea Czuchra, Felicia McNaught, and Tina Ballard. We are honored to have him with us for Flute Fest 2018. Hear Linda Chatterton on flute and Dr. Rachel Randwein on harp, performing the Uebayashi Sonate. Dr. Timothy Hagen will be performing POP for solo flute as well as the Martinu Sonata and Dr. Lauren McNee will be performing Dash by Jennifer Higdon, accompanied by Benjamin Cold on soprano saxophone and Seulgee Lee Nelson on piano. This recital will also feature Adam Kuenzel, principal flute of the Minnesota Orchestra! You won't want to miss it! Rhonda will perform an intimate, multi-faceted solo flute show, taking the listener on a journey around the world with an assortment of ethnic flutes and her Gold flute, woven together by stories. Among the variety of flutes are Indian bansuri, crystal flutes, Pan Pipes, Native American flutes, Celtic whistles, the Chinese dizi, and more. Her virtual band includes piano, acoustic guitar, synth, bass and percussion in a variety of ensemble configurations, while others are Larson's adventurous writing for flute alone. Rhonda's innovative technical abilities include her signature one-person duet of singing and playing simultaneously. Her music merges the most soulful elements of sacred, classical, folk, Celtic and ethnic music. The program consists chiefly of Ms. Larson's original compositions, and is accessible to audiences of all ages and genre preferences. Rhonda teaches masterclasses all over the world, and we are thrilled to welcome her to Minnesota. Rhonda strives to bring each individual to a place "within" themselves where they can play their music with technical ease and expressive, bold freedom. Ultimately, to reach the heights of each player's greatest potential. All this with the enduring reminder of why we play our flutes in the first place: because we LOVE it! We are certain you will learn new things and leave this class motivated to continue your journey with your flute.